Always a difficult hole to play with the wind blowing left to right from the elevated tee and plenty of out of bounds markers on the right to beckon the faded drive. 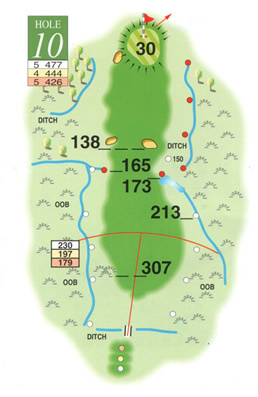 There are two ponds to deflect the eye 170 yards from the green, one left and one right, as well as two keenly sited fairway bunkers but once past these the approach shot demands careful club selection as the raised green is an upturned saucer so holding the green is the real aim here. It is a large green with many slopes and undulations to concentrate the mind but par is achievable.